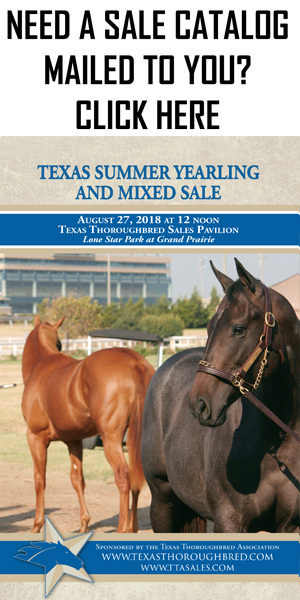 The Texas 2-Year-Olds in Training Sale held Tuesday on the grounds of Lone Star Park posted numbers that dwarfed those of the first juvenile auction held last year by the Texas Thoroughbred Association, which took over as the sale’s operator from Fasig-Tipton. With 70 of 93 head sold, this year’s auction recorded gross receipts of $1,873,900, a jump of 91% from last year when 53 of 66 sold for $981,300. The average soared to $26,770, up 44.6% from last year’s $18,515 while the median jumped 33.3% to $16,000 from $12,000. Buybacks this year were 24.7% compared to 19.7% last year. Last year’s sale topper was a Texas-bred daughter of Too Much Bling eventually named Bling on the Music who sold for $95,000 and has since won two stakes, placed in a Grade 2 and banked $153,082. This year, three horses topped the $100,000 mark and a total of eight brought $70,000 or more, compared to just the one last year. The sale-topper was hip 49, a Kentucky-bred colt by Tale of the Cat consigned by Benchmark Training Center, agent, who brought a bid of $120,000 from Carrol Castille. 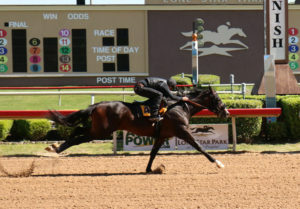 Named Dicken’s Tale, the February 1 foal worked an eighth-mile in :10.2 in the under tack show, which was delayed from Sunday to Monday due to weather. To view results as a PDF, click here, or to view the interactive results, click here.